This delicious fusion of luscious chocolate and maple sugar, packaged in a decorative gold gift tin, makes a wonderful holiday gift idea. 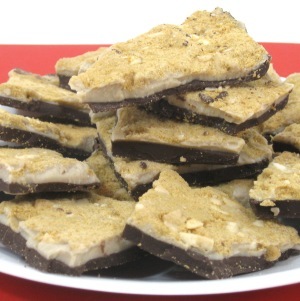 The candy consists of a layer of rich dark chocolate, then a layer of white chocolate that has bits of pure maple sugar candy dropped in, and lastly sprinkled with pure maple sugar. It's simply OUTSTANDING! 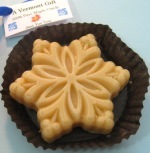 Best of all, this Vermont candy gift is only sold in our old-fashioned candy store, on this website, and through two other partnering websites - it's a very unique gift that isn't available everywhere. 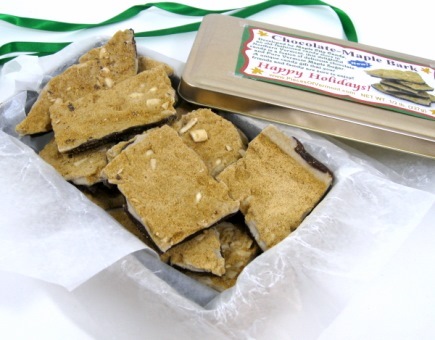 If you're looking for a unique specialty food candy gift, this is it! Each gold tin contains 1 lb. of Chocolate-Maple Bark. For a look at the gold gift tin, click on the chocolate-maple bark image to enlarge.